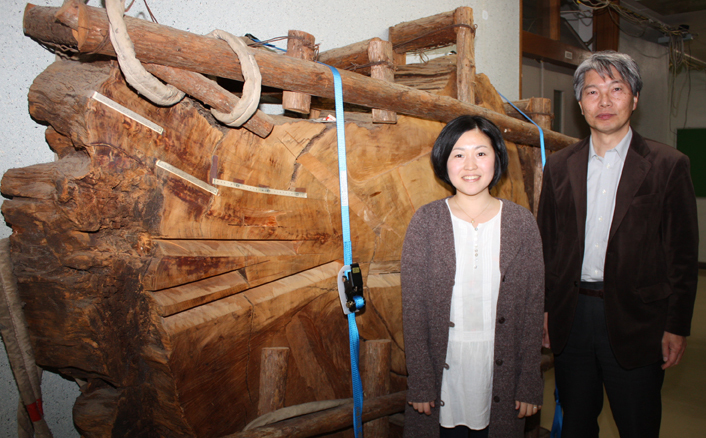 Associate Professor Kimiaki Masuda1 and Ms. Fusa Miyake2 at the Solar-Terrestrial Environment Laboratory, Nagoya University, have discovered a major increase in carbon 14 (14C) concentrations in tree rings from AD 994. In 2012 the group had found a similar increase in tree rings from AD 775, and together with this result the discovery will contribute to interpreting changes in space environment and their influence on the earth. Their paper was published online in Nature Communications on April 23, 2013. 14C does not exist naturally on the earth, and is produced by cosmic ray interaction with the terrestrial atmosphere. Carbon in the air is accumulated in trees via photosynthesis; thus by monitoring old tree rings we can estimate cosmic-ray intensity in the past. The group had measured tree rings of a 1900 year-old Japanese cedar, and in 2012 they found that the annual variation of 14C in AD 775 was 20 times higher than that caused by normal solar activity. It was possibly the highest increase in 14C in the last 3000 years, yet it was not really enough to specify the cause of the event, whether it was triggered by super flare phenomena, supernova explosion, or something else. The group's discovery in 2013 confirmed that the rapid increase in 14C also occurred in AD 994, and clarified that some sort of event causing the major surges has occurred relatively frequently. Both AD 775 and AD 994 coincide with periods of high solar activity, and consequentially, it is plausible to identify the cause of those extremely energetic events as super flares. If a super flare of this size occurred in the modern world, the ramifications to human society are immeasurable. In providing further details of the 14C flux, the group aims to contribute to predicting super flares in the future and estimating their effect on our planet. 2. A researcher at the Solar-Terrestrial Environment Laboratory, Nagoya University. She is funded by the Japan Society for the Promotion of Science. Associate Professor Kimiaki Masuda began this research due to his interest in cosmic radiation－how it is produced and what influence it has on our planet. He has consistently investigated the causes of small variations in 14C levels in the past, and contributed to deeper understanding of the cosmic environment. "You cannot foresee the future unless you know the past. I anticipate that my research on the phenomena of cosmic-ray outbursts can lead to forecasting what will happen in the future. " "Space has become closer than ever before. Why not explore the mysteries behind the sun and our planet?" "Another rapid event in the carbon-14 content of tree rings", F. Miyake, K. Masuda and T. Nakamura, Nature Communications, 23 April, 2013. "A signature of cosmic-ray increase in AD 774-775 from tree rings in Japan", F. Miyake, K. Nagaya, K. Masuda and T. Nakamura, Nature, 3 June 2012.